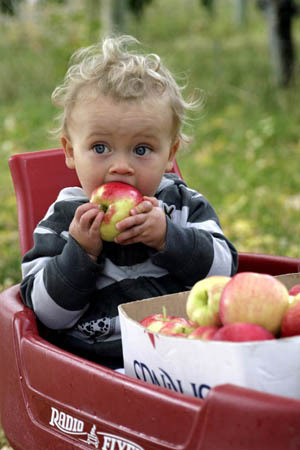 Are Apples Good For Baby Food? We’ve talked a lot in this blog about the health benefits of apples for adults, but you might be wondering if they are also good for babies. And if so, how can apples be safely prepare as baby food? Ambrosia apples make a great first fruit for babies for a number of reasons. Firstly, apple allergies are uncommon (although, like any new food being introduced, reactions should be taken seriously). Secondly, apples are easy to digest. Thirdly, they are just as healthy for babies as they are for adults. And finally, sweeter apples like Ambrosia, are more likely to be loved than the tarter varieties. How you prepare the apples depends on the age of the baby. Infants under a year old should have their raw or cooked apples pureed. However, cooked apple puree is sometimes easier for the baby to digest. Once the baby is over a year old or eating more solid foods, then cubed apples (either raw or cooked) can be a fun snack for them to eat. At this stage, peeling the apple is optional. The difference between pureed Ambrosia apple sauce for babies and store bought apple sauce or even homemade apple sauce for adults is sugar and spice – as in, you don’t need to add any to your baby’s food. Simply blend a cored and peeled apple and you’re good to go. Best of all, because of their honeyed flavour, you do not have to add any sugar when cooking or blending Ambrosia apples! If you prefer to cook your apples before you blend or mash them, there are several options. Many people like to stew their apples and that’s a great option if you want a runnier consistency. Be sure to stew your apples in just a little water and blend that water with the apples to maintain all of the nutritional goodness. Other methods for cooking Ambrosia apples are steaming or baking them – both options help to hold the nutrients in. In either case, wait for them to cool and then mash or blend the apples to create your baby food. One final tip. When you go shopping for your Ambrosia apples for your baby food, remember to grab a few extra Ambrosia for yourself because having one with your baby will help give you energy and keep you healthy through what can often be a challenging time.